It’s the middle of the year and as every parent of school going children knows, it’s report card dayyyyyyy. 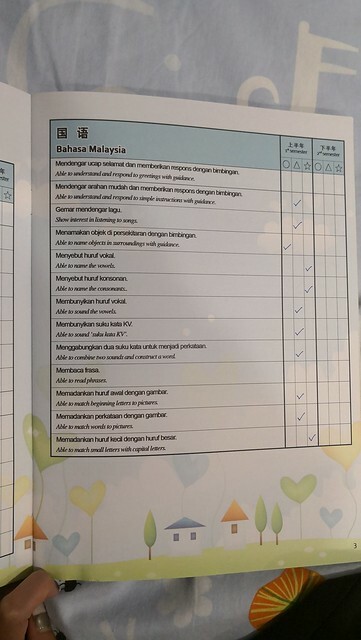 I’m the kind of mom who gets excited over her kids’ progress reports so F my kids’ lives especially if they don’t do well next time hahaha. I walk Penny right in to her classroom and chat with her teachers most days, but Fighter’s school is a lot bigger – every day I just drop him off at the entrance and rush to send Penny to school after that, so I never get to talk to his teachers. Parent teacher chat would be the first time I get to really talk to them! 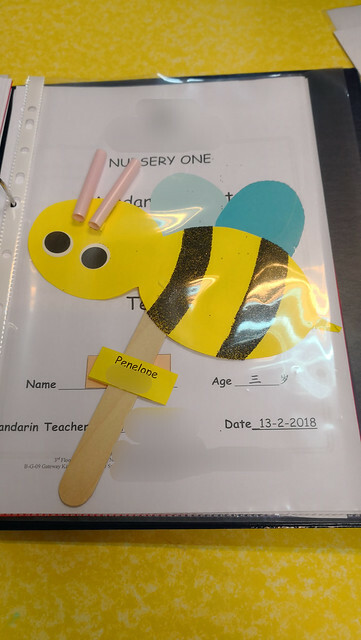 This year was also interesting because it’s Penny’s first proper year of school so it’s also her first school report ever. Compared to Fighter I can see Penny is naturally more graceful and athletic la hahaha. 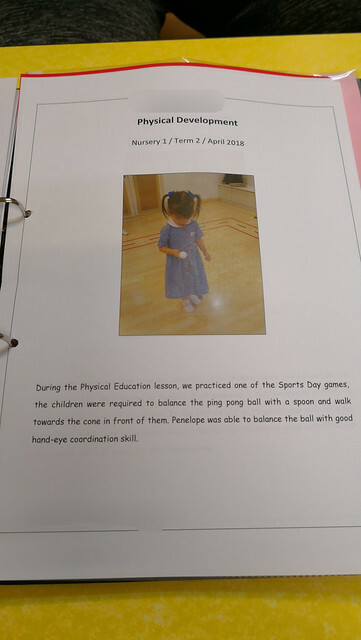 But the funny thing was, Teacher told me that when they practiced balancing the ping pong ball, they only noticed how perfectionist Penny is and how determined she is to do things correctly. To her, the whole point was to not drop the ball so she walked unbearably slow. Lol. 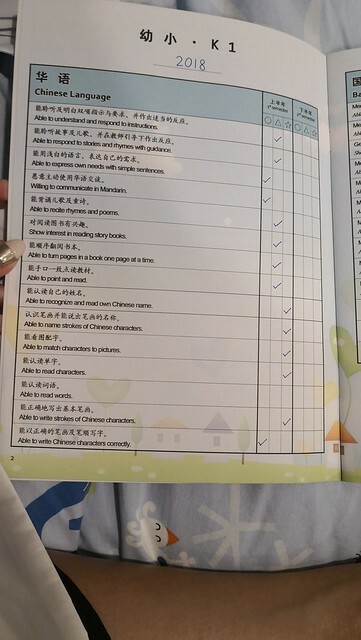 Teacher encouraged her to walk faster so she obeyed and ended up dropping her ball and getting mad at the teacher for forcing her to walk faster hahahaha. When she resumed, she walked at her snail’s pace again hahaha. Not only does Penny understand classroom routines and teacher’s instructions, she is also very good at bossing her friends around and forcing them to obey the teacher WTF. Hahahaha. 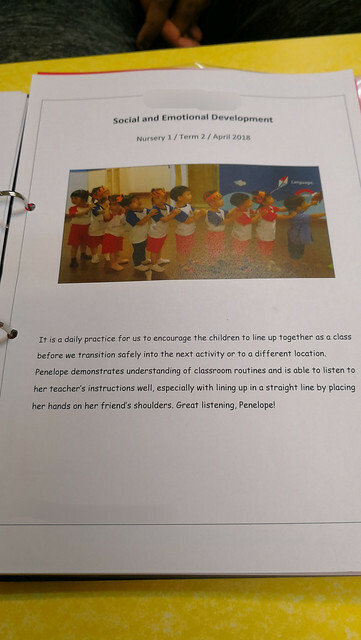 On the other hand, the teachers in school have taken to calling her ‘class monitor’ cos she helps her teachers get the class in form, calling them out when they fall out of line, helping her friends keep their water bottles, etc. She’s a perfectionist when it comes to getting her work done. Most apparent in their arts and crafts, of which they do a lot. 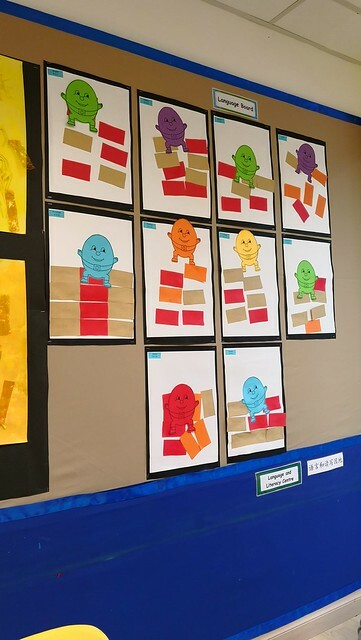 The teacher usually shows the class an example of how their artwork should look like, and the kids have to do their best to follow the instructions. Other kids just listen one time and then do it. Not Penny. She watches as the teacher demonstrates, then while she’s doing her work, she carefully refers back to the sample to make sure she’s got it right. Check out her bumble bee above. I couldn’t have done it better wtf. And see this display of Humpty Dumptys on brick walls. Guess which one is hers. Lolol. Teacher also told me she got damn a lot of admirers in class OMG. Like nearly every boy likes her and wants to sit with her OMG OMG. I asked, huh, why her!? Teacher said, well maybe cos the other girls in class are boisterous and active, while Penny is soft spoken and demure. Say what. Whose daughter are you talking about wtf. At home Penny is damn bossy and loud mouthed and active can? Well apparently she’s not like that at school hahahaha super cheat people. What the teacher said is true though. Every few weeks she will tell me who’s her boyfriend and it’s always a different name WTF. *rubs temples* Although to her ‘boyfriend’ literally means a friend who’s a boy la. 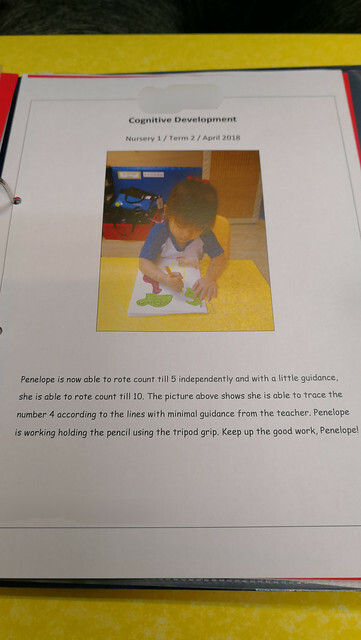 TL;DR: Penny is doing very well at school! She’s competitive and does her best in every task. She’s slightly obsessive about being neat and putting things away but I take it as a good thing. ^^ She loves story time and speaks one of the best out of her whole class (which I feel is cos she has an older sibling while every other kid there is the oldest or only child in their family), although she can’t pronounce her own name yet and keeps saying her name is “Banana-pee” HAHAHAHA. 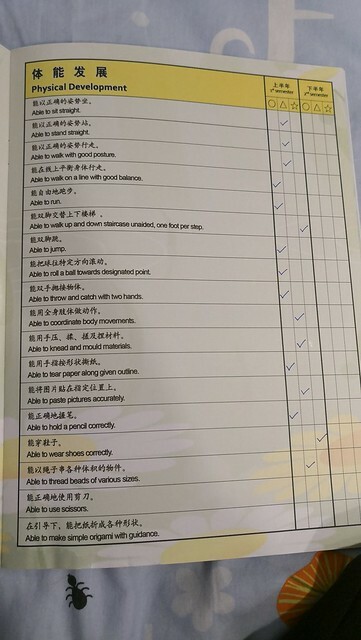 In Fighter’s case, we received their report cards first before we met their teachers. Fighter very conscientiously informed me to check his report and that I have a lot of “homework” to do ie inspect his report and sign it. Either he’s very naive to the ways of the world, or he must have thought he did very well. LOL. 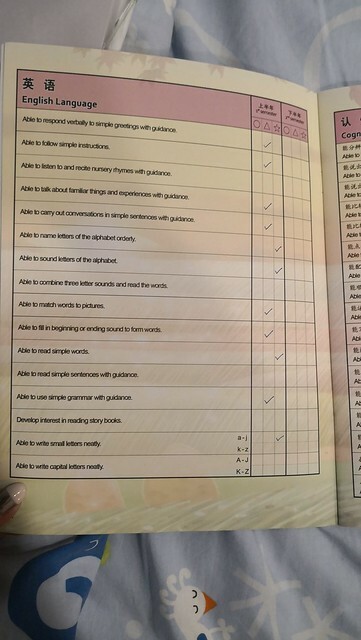 This is his English report. For some context, star = excellent, triangle = average/meet requirements, circle = needs work. However, the teacher told me that for the first semester, they usually rate triangle so there will always be room for improvement in Semester 2. So I’m guessing that if they get a star in the first sem, means they excellent until the teacher cannot deny wtf. Fighter’s English is okay la got a few Excellents and the rest are average. As should be la since English is his first language. BM he has some things that need work: naming objects around him in Malay… actually only that one wtf. I feel not bad too considering that this is the first year he’s even been exposed to Malay! Chinese. Jeng jeng jeng. 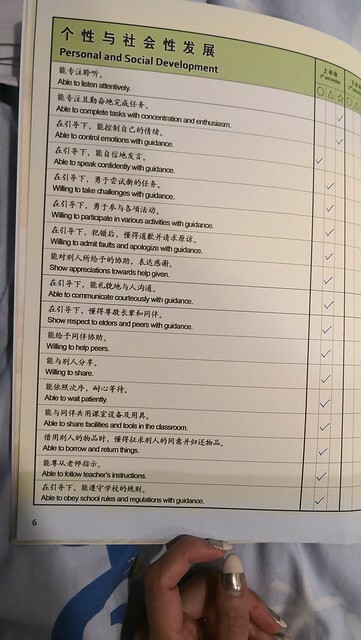 The things he needs to improve are: able to express own needs with simple sentences, and willing to speak in Mandarin, which to me are the same thing la. Also cannot write Chinese characters correctly haha. 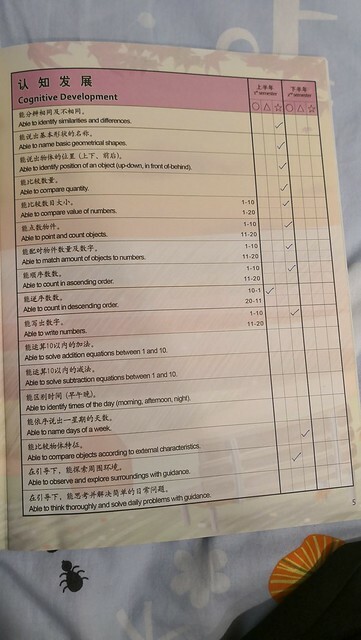 I already know his writing not good cos his fine motor skills also not that good la wtf. I was surprised though that he wasn’t speaking in Mandarin cos he actually seems to really enjoy Chinese. I asked him and he said he was too shy to speak hahaha. I also sort of knew this already cos quite often (although recently not as much anymore) this boy would be all okay in the morning and in the car. But when we arrive at the school gates, he’d give me sad puppy eyes and dramatically grasp my hand before reluctantly getting down. O_o FML la hahahaha. Sometimes he’d even be teary eyed so I supposed that was why he failed this aspect lolol. Cognitive development – apparently cannot count down from ten to one wtf. But I dunno if this was graded some time back cos when I asked him to do it for me, he did it with ease. 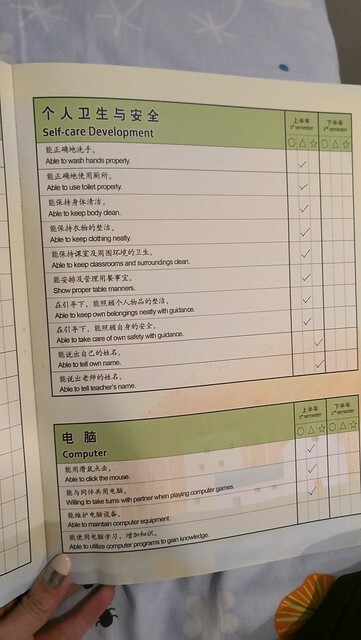 No problems with self care or computer skills! This was the area he needs the most improvement in. All I have to say is he completely takes after me HAHAHA. The only things he can do absolutely well is walk stairs one foot at a time and it’s cos we have stairs at home. He can also put on his shoes and that’s cos I’m too lazy to bend down all the time hahahaha. When I talked to his teacher, she told me that Fighter is the only kid that when he runs she pays full attention cos she’s so scared he’ll fall down. O_O When he runs (or walks) apparently sometimes his feet don’t even face straight so he trips over himself. I had a revelation then. Is that why I’m always tripping myself?! At school waiting for my turn to talk to the teacher. Fighter’s test results are actually really good. He had full marks for most things and those he didn’t get, the most he missed is one or two questions. I actually thought the teacher fed them the answers until she confirmed that those were tests and she didn’t. Fighter is the most focused child in the whole class. O_O Apparently he’s the only kid who can sit still an entire lesson and not take his eyes off teacher. Which is why he learns so quickly and well – because he’s very good at concentrating. I wouldn’t have guessed! Part of the reason why he’s so focused in class could be cos he’s scared the teacher will scold him though wtf. He has never been scolded or punished cos he’s so well behaved but apparently he lives in fear that teacher will scold him cos she’s always scolding other boys wtf. Usually the girls are more guai, so Teacher lets them go off to recess or wherever first while she scolds the boys/waits for the boys to calm down. So because Fighter identifies as a boy, his lower lip will start quivering and his eyes will turn red… until Teacher sighs and says, no not you Jude. You can go ahead with the girls. Then he’ll nod sniffingly and go off with the girls. HAHAHAHA WHY OH WHY. Socially, he plays with other children but sticks the closest to Chase. When he doesn’t know how to do something, he doesn’t even try but goes to ask Teacher immediately. He does this at home with me too which annoys me cos he doesn’t even try! He has low confidence in his drawing skills and honestly his friends draw way better than him cos I can see he’s not very interested in coloring and drawing in the first place. Did not get in from me okay I am actually very good in art wtf. He cries a lot in school. I didn’t know this and I was slightly worried to hear. Teacher said he really is quite anxious and would cry over things like forgotten pencils or handkerchiefs. I’ve seen this side of him at home but didn’t realize he was like this in school too. It’s like he panicks over the tiniest thing that isn’t 100% correct and cannot see reason already. T_T I don’t know how to fix this also to be honest. Teacher has been reassuring him and I’ve been doing the same at home la so at least I know I’m on the right track wtf. 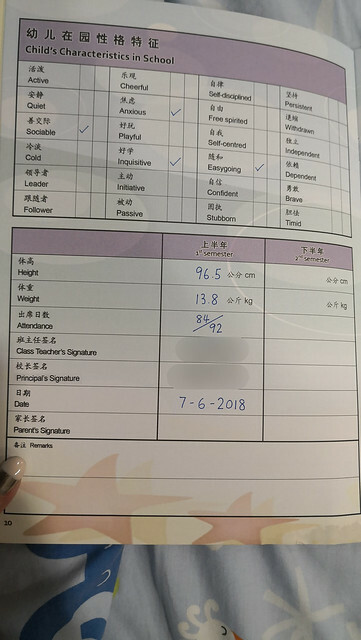 He has been improving, although Teacher said the other day she was just doing her teaching thing, when suddenly she heard a loud wail then someone burst into tears. It was Fighter wtf. 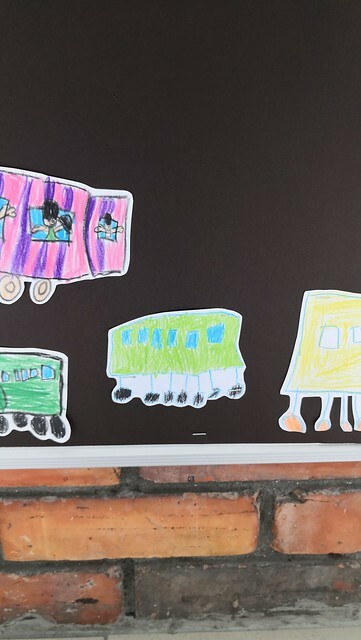 The kids were tasked to draw and color a vehicle each, and the teachers would take each drawing and paste it into a mural on the classroom wall. Fighter was drawing a van and apparently his friend said his drawing sucked LOLOL so he cried omg. I went outside to check out his van and indeed it’s very weird cos it has legs WTF. Oh well Dali drew melting clocks okay what do you guys know about art. TL;DR: Fighter is academically very bright, yet sensitive, anxious and clumsy wtf. I thought it was pretty interesting though that both my children are fussed about getting things correct and perfect. The difference is that Penny is determined to create a perfect specimen and she makes sure she does that. Fighter wants to get it right too, but if he doesn’t have the confidence, he gives up without even trying. Maybe because better to not try and not fail, than to try and fail? In that way, he reflects me exactly. I too am used to always doing well academically, yet I’m afraid of reaching beyond my comfort zone because I’m scared of failure. There are so many things I want to do but don’t because I’m scared to fail. It’s quite jarring seeing my flaws in my son. Maybe that’s what parenting is about though. Learning how to raise a good, well rounded person, and learning more about yourself as you go along. 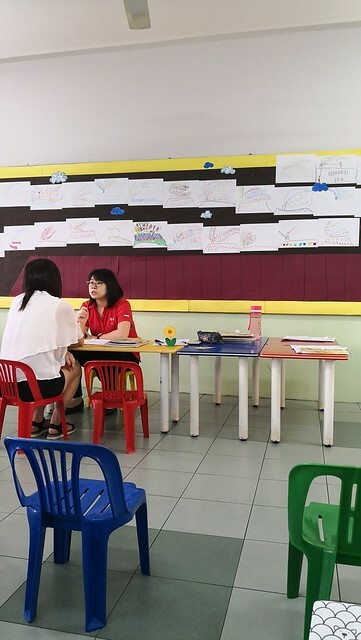 im easily paranoid over smtg (where is my key, did i lock my house, did i lock my car, did i forget anything), very care over someone comment on my work X’DD and try to be the “best” or most ” guai” in the class so that teacher wont scold me and at home also try not to make my mum angry. ahaha. I’m left handed too and my parents always tease me im a cry baby and always fall down for no reasons until 10 years old. wtf. the thing that i dislike about myself the most is my self-confidence still low (I’m 25!!) and i just cant boost my confidence up. ='( i always feel bad for this. Im still figuring how to make myself dont always feel bad.